hope you are having a great Friday. It has been beautiful the last 2 days after much needed rain and it is warming up again. After a natural watering the garden is really coming along nicely. Can't wait for those green beans on my plate and tomatoes sun ripened right off the vine. Oh summer is almost here. Well today I did a bit of creating, I decided to work on my 2nd week of the Summer of Colour. I had some trouble at times completing it because Rosie decided she wanted to paint as well. I told you before she isn't really a photogenic cat, I try to catch her straight on but she usually moves just as I am taking her pic. You can see here she is showing some attitude. I think she was trying to pretend she wasn't going to drink from the paint water, she tries when I am not looking and if I cover it she takes the cover off and has s drink. 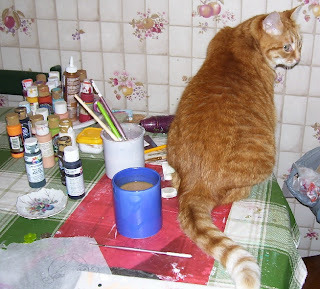 As you can see the paint and brushes are out and she got her whiskers painted, she loves when I do that. Needless to say I had to wait til she moved before I could settle into my chair which is to right where she is looking. 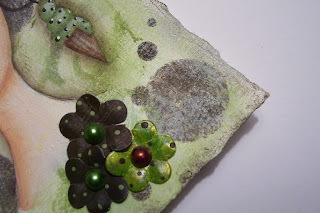 And I completed this for the Summer of Colour week 2, Mint Chocolate but I am just showing you a sneak peek. Can't show you the whole thing til Monday...I painted everything you see, even the paper flowers. I also worked on a canvas today and it is coming along nicely. 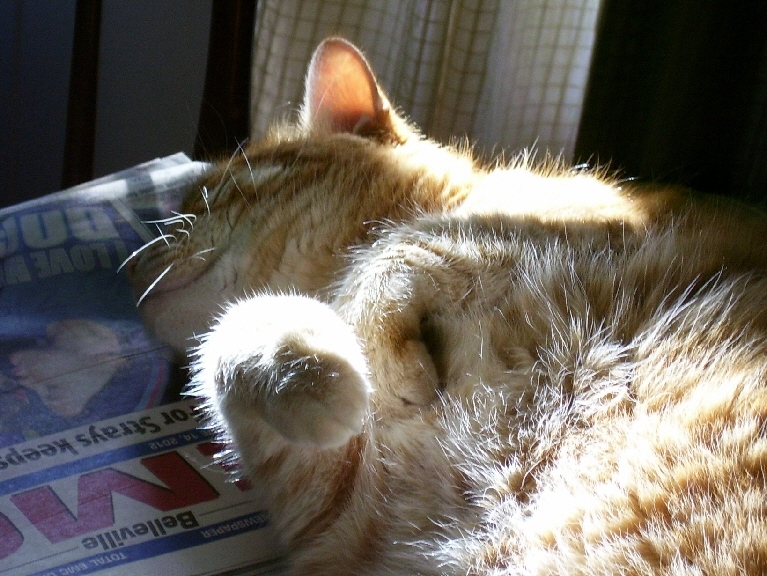 Oh Les...Rosie is sweet and precious in her sunbeam puddle...I love ginger girls! Cute cat Les! Looking forward to seeing your Mint Choc creation and canvas.